Folk/parlor songs. 13 danceable tunes, from waltzes to swing: a soft shoe, a foxtrot, a gypsy dance, witty novelty songs and tender love duets, all written with Smith's signature charm. O'Reilly's old-style vocals and Smith's classic phrasing. 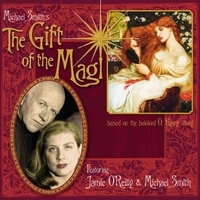 2013 Celebrates the 10th Anniversary of "The Gift of the Magi" CD! Created as music for an Americana Ballet, (choreographed by Judith Svalander and Greg Begley) and based on O. Henry's beloved story, this CD album features the musical team of Jamie O'Reilly, (Vocals, Producer) & Michael Smith, (Vocals, Guitar, Composer). Musical styles from a variety of American traditions - music and dance theater, turn of the century style parlor music and vaudeville, and folk. Smith, composer of "The Dutchman", (one the most loved songs in the folk genre) wrote all original songs. He and O'Reilly have created "a wonderful, wonderful, wonderful CD and a new classic! ", says Rick Kogan of WGN Radio Chicago. Kogan, along with actor Paul Amandes, performs as The Narrator at live concerts of The Gift of the Magi..
Shimmering, polished performances by the duo and a stellar musical ensemble, as they perform on 15 exciting tracks, including 13 danceable tunes, from waltzes to swing, a soft shoe, a foxtrot, a gypsy dance, witty novelty songs, tender love duets and Christmas carols. On the CD Michael reads several excerpts from the O. Henry story. The CD is set in a lush and lovely Vaudeville style Old New York poster design. Songs are performed on a variety of guitars, violin, cello, bass and piano. Jamie and Michael provide the lead vocals. With Pat Fleming (Guitars), Miriam Sturm (Violin), Bob Weber (Cello), Katrina O'Reilly-Greene (Piano), Al Ehrich (Bass) and Anne Hills, (Guest Vocals). Recorded at Dr. Caw Recording, Northbrook, IL. Produced and distributed by J. O'Reilly Productions. "Gotta Like a Guy," "Pawnbroker's Lullaby", "The Magi", and "On Our Own." Other songs include "I Wish Someone Would Take Me Dancing" "Nineteen and Five","Long-haired Woman," "A Wanderer am I," and Christmas carols: "We Three Kings", "Silent Night", "I Heard the Bells on Christmas Day". The songs on the recording hearken back to the halcyon days of parlor songs and vaudeville-the pre-radio era-when novelty songs and waltzes could be heard wafting through the air in the 'tin pan alleys' of overcrowded New York City, and even the poorest of young lovers had a song in his heart! It is the story of Della-who sacrifices her long hair for Jim-who pawns his heirloom pocket-watch for Della, and it celebrates true love's triumph over adversity. "Thinkin' about the three kings and Christmas with no money and folks who won't accept defeat." Set in an era of economic hardship and struggle-turn of the century New York City, the music draws from the rich music hall tradition that was New York in 1905. The lyrics tell of a city boasting modernization and new invention, from the trolley to the telephone and of neighborhood flats bursting with activity. They tell of the dashed dreams of wide-eyed innocents and off-the-boat immigrants, and the colorful characters they do business with: Madame Sofronie, once a gypsy princess in old Russia now relegated to making wigs for society ladies, the sly, dealmaking Pawnbroker whose watches are all set to the time of President Lincoln's death, and Jim and Della, the down-on-their luck newlyweds taking refuge in the wonder of Christmas. The Montreal Gazette's weekly CD reviews and was published December 18. "The Gift of the Magi," O. Henry's classic Christmastime story set in New York City in 1905, comes to musical life via Michael Smith's marvelous original songs, several traditional Christmas carols, and a couple of readings from O. Henry's story about a young couple who each sell their most prized possessions to get money to buy the other a special Christmas present. Smith sings the male roles of Jim and the pawnbroker while soprano Jamie O'Reilly sings as Jim's wife Della and Madame Sofronie. In solos, and in Jim and Della's duets, Smith and O'Reilly both shine. The musical palette ranges from quiet songs to exciting gypsy and swing tunes, waltzes and parlor songs played by an excellent ensemble highlighted by John Mellencamp's violinist Miriam Sturm. The Gift of the Magi is one of my facorite Christmas stories. This beautiful CD has only enhanced the pleasure that the story now brings. I will make it part of a Christmas tradition in my home. I have also bought a video version so we can read, watch and listen to the lovely, appropriate music. Do not hesitate to check this out! There is no other song writer and performer like Michael Smith. He is a national treasure. Couple him with Jamie O'Reilly on this wonderful presentation and you have magic. Do not hesitate to check this out! A veritable Christmas basket, overflowing with musical treats. Glorious voice, wonderful songs, makes my holiday special, thank you! This has always been one of my favorite Christmas stories and I so appreciate the appropriate songs. The lyrics are perfect and capture the essence of O. Henry's story. Tunes that continue to be good listening, long after Christmas. Consistently interesting, solid performances--they really stick in your mind. I've bought it as gifts for 2 friends. The music, story and singer all very enjoyable.